Diving into Submarine Movies: How Realistic are They? The helm of the Ohio-class guided-missile submarine, USS Florida (SSGN-728), in March 2010. Photo courtesy of United States Navy. A lot of people are fascinated with submarines, perhaps because of their stealthy missions, long periods underwater, or because few people have been aboard one. The public’s concept of submarine life is influenced by what they read and see, particularly movies, which begs the question – How realistic are they? I’ll start with Hollywood movies in general. What most people envision when they think of submarines are the small, grimy diesel boats featured in dozens of older movies. Today, the United States only uses nuclear powered submarines – clean behemoths compared to their diesel boat counterparts. For example, Ohio class submarines, which carry Trident ballistic missiles, are almost two football fields long, seven stories tall from the keel to the top of the sail, and wide as a three-lane highway. Despite the size, however, there still isn’t much room inside, as submarines are packed with the equipment necessary to operate and engage in combat. When it comes to Hollywood movies that feature modern nuclear submarines, the most popular movies are The Hunt for Red October and Crimson Tide, so I’ll focus on those two. 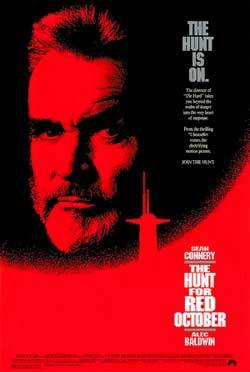 The Hunt for Red October was largely authentic, except for a few issues. One example is when the commanding officer on USS Dallas signaled a destroyer by flashing Morse Code from the submarine’s periscope. Nope. Periscopes don't have flashing lights, and you won’t find an officer in the Submarine Force who knows Morse Code. The most glaring deviation from reality in The Hunt for Red October was at the end, when the admiral presses the self-destruct button and detonates the Lightweight Torpedo shot at Red October. Nope again. Although Heavyweight Torpedoes (launched by submarines) remain attached to the submarine by a thin guidance wire over which commands can be sent, Lightweight Torpedoes (launched by surface ships, helicopters and fixed-wing anti-submarine aircraft) have no guidance wire, and neither type of torpedo can be remotely detonated. Finally, one of the most memorable quotes in The Hunt for Red October – “One ping, Vasily. One ping only,” is also inaccurate. Modern submarines do not “ping” like you hear in Hollywood movies. They use higher frequency, complex waveforms that are difficult to detect, and even if you detected it audibly, it would sound more like a sick bird than the powerful pings you hear in movies. Now comes Crimson Tide. While the movie was entertaining, it was about as far from reality as you can get. It’s laughable from an authenticity standpoint, beginning with the plot itself, which revolves around the conflict between the submarine’s commanding officer (Gene Hackman) and its executive officer (Denzel Washington), when Hackman relieves Denzel because they disagree on whether to launch. That’s the first serious error. The protocol on ballistic missile submarines is that both the commanding and executive officers must give the order to launch or the crew won’t respond, and the commanding officer cannot relieve or fire the executive officer. In the scenario portrayed in Crimson Tide, what would actually have happened when Denzel disagreed with Hackman, was that the crew would not have launched. End of story. However, that would have resulted in a boring and very short movie. So they played loose with the facts and allowed Hackman to fire Washington, setting the stage for an exciting conflict as the crew chose sides. You could argue both Denzel Washington and Gene Hackman’s characters were right. Another question that comes up concerning Crimson Tide is who was right, Hackman or Washington? The answer is – both. Hackman was technically correct, but Washington’s position was valid. By protocol, a ballistic missile submarine will execute the last valid order received. In the scenario in Crimson Tide, a valid Strike order was received and the submarine crew will launch its missiles when the first launch window opens, unless they receive a valid termination order before then. In the movie, they receive a Termination order that is incomplete because they lose communication, and an incomplete Termination order is invalid. By the letter of the law, the Strike order is still valid and they are required to launch, so Hackman was correct. However, under normal circumstances, every commanding officer and executive officer I know would have done what Denzel recommended – wait and attempt to receive a valid termination order. So what I expect would happen is a submarine crew would skip the first launch window and wait for the next one, and in the meantime attempt to regain communications and download what appears to be a Termination message. However, Crimson Tide added a twist, in that they had been directed to take out Russian ballistic missiles that were being prepped for launch, so they couldn’t wait for the next launch window. If Hackman waited, there was the chance that the Russian missiles would be launched and millions of Americans would die. But if a Termination order had actually been sent because the situation had been defused, he risked starting World War III if he launched. Crimson Tide set up great scenario, as the crew didn’t know the real world situation and there was no way to determine which course of action was correct. It would come down to a difficult decision by both the commanding officer and executive officer, but as I said above, once Denzel disagreed with the launch order, it would have been All Stop. No missiles would have been launched and the Crimson Tide scriptwriters would have had to figure out how to entertain the movie audience for another hour and a half. I’ve addressed the plot of Crimson Tide, which is far-fetched. Unfortunately, the rest of the movie is worse. The submarine interior design was unrealistic, the dog and the fishbowl on the submarine were ridiculous, and the relationship between the officers and enlisted men absurd. No submarine officer in their wildest dreams would tell an enlisted man to drop and do pushups. It was obvious there was no official Navy help, or the movie producers decided to deviate from reality for cinematic purposes, because about the only thing realistic about the movie was the name of the submarine. I wouldn’t watch this show, even if it was a last resort. Okay, I’ve told you The Hunt for Red October was fairly realistic and I’ve skewered Crimson Tide. Since we’re talking about Hollywood portrayal of modern submarines, I’ll throw in the short-lived television series Last Resort. I never watched an episode because the basic premise was unrealistic. There are no ballistic missile submarines with SEAL detachments on board. We have four guided missile submarines that carry SEALs, but those submarines are armed with Tomahawk cruise missiles, not nuclear warhead-tipped ballistic missiles. Just from watching the previews, I knew Last Resort would be too painful to watch. SEE ALSO: 12 Things You Didn't Know About Life on Submarines! If you want to learn what life is really like aboard submarines and how modern submarine warfare is conducted, or how our crews process nuclear strike orders, I recommend you read my two books: The Trident Deception and Empire Rising. I've served on four different nuclear powered submarines, and on my last submarine, I was one of the two men whose permission is required to launch its nuclear warhead-tipped missiles. (i.e. I was Denzel in Crimson Tide.) Aside from a few slight modifications so classified information isn’t revealed, those two books are as real as you can get with respect to submarine and weapon capabilities, how our submarine crews engage in combat, and the protocols and procedures involved in launching nuclear weapons. Empire Rising goes even further, incorporating significant surface ship, aircraft, and SEAL team scenes, and although I’m not an expert in those areas, I interviewed those who are, and they also reviewed their applicable scenes to verify everything was as authentic as possible, something both The Hunt for Red October and Crimson Tide failed to do. Comment below for a chance to win a copy of Empire Rising and The Trident Deception by Rick Campbell! Empire Rising Comment Sweepstakes: NO PURCHASE NECESSARY TO ENTER OR WIN. A purchase does not improve your chances of winning. Sweepstakes open to legal residents of 50 United States, D.C., and Canada (excluding Quebec), who are 18 years or older as of the date of entry. To enter, complete the “Post a Comment” entry at https://www.criminalelement.com/blogs/2015/02/diving-into-submarine-movies-how-realistic-are-they-the-hunt-for-red-october-crimson-tide-empire-rising-the-trident-deception-rick-campbell beginning at 1:00 p.m. Eastern Time (ET) February 19, 2015. Sweepstakes ends 12:59 p.m. ET February 26, 2015. Void outside the United States and Canada and where prohibited by law. Please see full details and official rules here. Sponsor: Macmillan, 175 Fifth Ave., New York, NY 10010. Rick Campbell, a retired Navy Commander, spent more than 20 years on multiple submarine tours. On his last tour, he was one of the two men whose permission was required to launch the submarine's nuclear warhead-tipped missiles. Campbell is the author of The Trident Deception and Empire Rising, and lives with his family in the greater Washington, D.C. area. The M.O. : Submissions are Open for the Next Two Weeks! I would really be interested in reading these books. I went on board a decommissioned submarine at a naval museum, and cannot imagine the mental strength necessary for serving in such a cramped and claustrophobic space. Thank you for a chance to win copies of Empire Rising and The Trident Deception. I enjoy reading technothrillers. I read and liked The Trident Deception. I enjoyed the technical details as much as the story. Sounds educational and entertaining at the same time. I’m in. All great moveis and sound like fascinating books. Thanks for the chance to win. Fiction or nonfiction, books and movies about submarines are so fascinating! Fiction or nonfiction, books and movies about submarines are fascinating! Sounds great. I would ike to win. I would love to win these books. I saw the 1st movie but never read the book so it would be interesting to see if there are any differences. Hope I win. These sound like good reads. I am so excited about this new book. I can’t wait to get my copy. Not to mention the exterior shots of the sub in Crimson Tide aren’t even of the right class of boat. For my money, the most realistic movie about sub life is Down Periscope. Lost track of how many times that flick got burned. Thanks for the chance! Submarines are fascinating. Das Boot is one of my favorite movies. Underwater fun! These look to be excellent reads. Love submarine movies – my favorite is The Enemy Below. I want a submarine! Or at least a book about submarines! Yes! Sounds like an intense read. Love it! This I would love to have & enjoy. Really looking forward to this book coming out! I would love to read about how the movies got it wrong! I loved “The Hunt for Red October”. Looking forward to reading these books. Thnaks for the chance to win! Fascinating details about submarines and the reality of life aboard. It makes reading novels and watching movies featuring subs much more entertaining. Wow this looks intense! Would love to check it out! I would love to have these books!! Thanks for the chance to win them!! While I am slightly claustrophobic and could never have been on a submarine or carrier, I admire the personnel that does carry out service on ships of this kind. These are great stories and I enjoy these types of movies and books as well. Thanks for the giveaway! I’d love to read a book where the det’s are accurate! This would be a great read. I love to read and would love to win. I would like to read the work of Rick Campbell. Sounds like a winner. Thanks for the chance. I would love to read the books. They sound very interesting. These books sound very interesting! I’d love to go on a sub cruise. Man, I hate when Hollywood doesn’t do their homework! Very interesting reviews, thanks for the great giveaway! These sound like excellent books. Congratulations! I was Navy air, but I love submarine stories. It’s sad when experts in a field can’t watch a fictional movie that diverges from reality. I remember when the Navy released a statement disowning “Crimson Tide”. “Periscope Down” was closer to how life on a submarine was. There have been a few “wild” CO’s but they were usually the ones people liked working for. “Rickover stories” are better than a Tom Clancy novel.